You may remember from my previous post highlighting Independent UK Beauty Businesses HERE that Curly By Nature is apart of a Collective called The United Kurls. 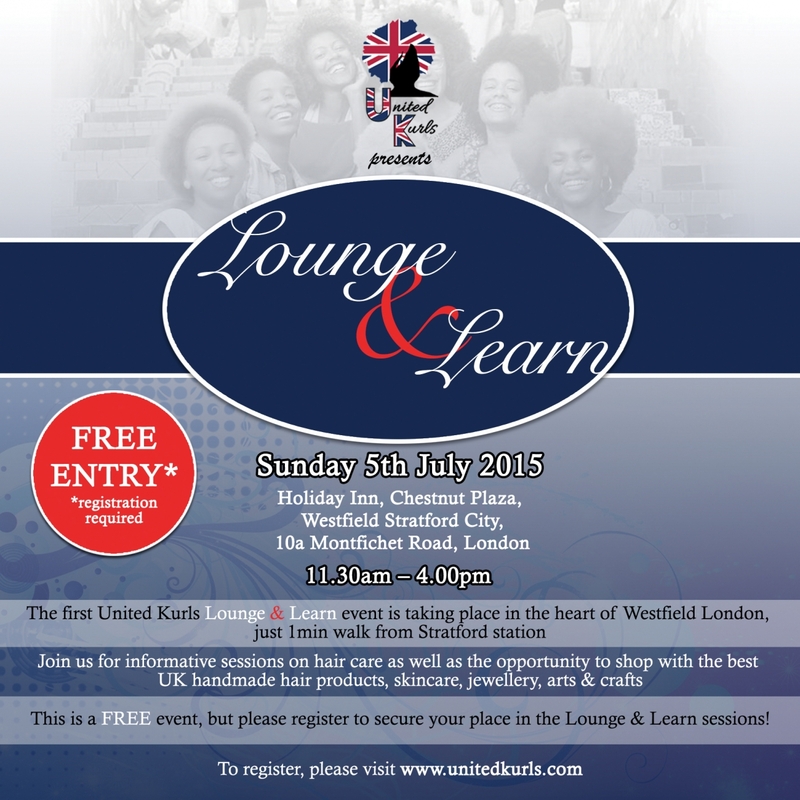 We have created something special and I am so proud to announce and pleased to present ‘The United Kurls: Lounge & Learn’ event, a bi-monthly shopping experience that will highlight home grown UK small businesses as well as provide informative sessions on hair care & products. We have so much in store and this is just the beginning of what we have to offer you. I hope that you come and visit us! ‘Lounge and Learn’ while you shop! LOUNGE: come and hang out with the members of The United Kurls Collective and other exciting fashion, jewellery and skincare brands. LEARN: We have 2 exciting sessions designed to boost your knowledge of hair and the industry. In addition we are offering you the chance to sit with an expert an build a personalised hair care program to effectively reach and maintain your healthy haircare goals. Klerissa McDonald Eco haircare specialist (Natural Methods & Ingredients) and founder of award winning British brand Curly By Nature, will conduct an in-depth analysis of your personal hair history, health, preferences and ultimate hair goals. After completing an in depth assessment (before event) and a short but in-depth discussion or practical session (one to one appointment at event) you will receive a Personalised Haircare Prescription. This offer features tailored specific professional advice and effective tips to achieve your ultimate healthy haircare goals accompanied with a list of recommended high quality products, tools and accessories you may choose to purchase on the day. Why are handmade products more expensive? Almocado & Sheabutter Cottage explain what goes into making natural products, how to read the labels & make the best choice for your hair. Guest speaker & author Dr. Lola Akingbola of Lolascurls.com shares some simple steps to building a hair care regime. Come and shop, lounge and learn!